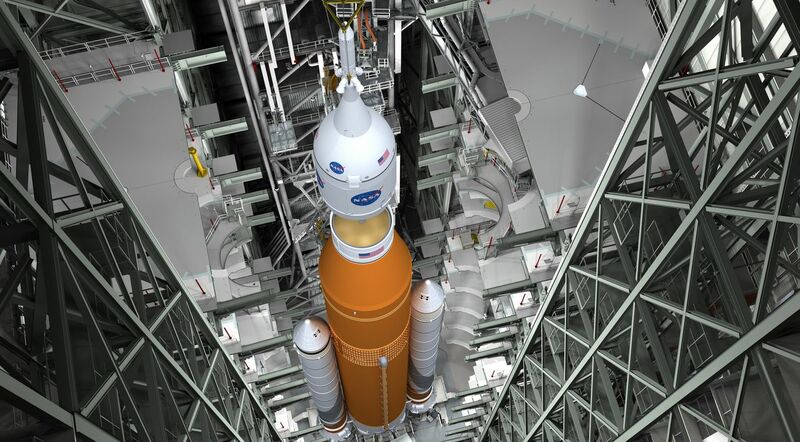 NASA has confirmed the first flight of the Orion / Space Launch System (SLS) will not include a crew. As I recently reported, the US space agency had been considering shifting gear with with the new combination of launch vehicle and the Orion Multi-Purpose Crew Vehicle to include a crew on the maiden flight, referred to as Exploration Mission 1 (EM-1). The change in direction was prompted by a request from the Trump administration to acting NASA Administrator Richard Lightfoot, in an attempt to accelerate the human space flight programme. On Friday, May 12th, Lightfoot indicated that while it would be technically feasible to make EM-1 a crewed mission, the agency would not do so on the grounds of costs. For an uncrewed flight, the Orion vehicle does not need to be equipped the life support, flight control and other additional systems a crew would need. would require. Doing so would require an additional expenditure of between US $600 and $900 million – costs which would otherwise be deferred across several years in the run-up to the originally planned crewed launch for Orion / SLS – called EM-2, slated for 2021. However, EM-1 will still be delayed until mid-2019. The reasons for the EM-1 delay are due to unrelated issues with various parts of the Orion / SLS programme. Again, as covered in recent Space Sunday updates, the European-built Service Module, which will provide the Orion capsule with power, consumables and propulsion, is running behind schedule. In addition, the programme is also experiencing delays in developing key software. These issues mean that pushing back the EM-1 launch was fairly inevitable. Had NASA been able to comfortably combine equipping the Orion vehicle for a crewed launch in 2019, then it would have roughly coincided with the 50th anniversary the first human lunar landing by NASA astronauts Neil Armstrong and Buzz Aldrin during the Apollo 11 mission in July 1969. Instead, NASA will continue implementing the current baseline plan, with the second Orion / SLS flight carrying a crew into space. However, this mission may also be pushed back beyond 2021. As I’ve been covering, the joint NASA-ESA Cassini mission to Saturn is now in its last phase, as the spacecraft makes a final series of 22 orbits around the planet, diving between Saturn’s cloud tops and its rings in the process. 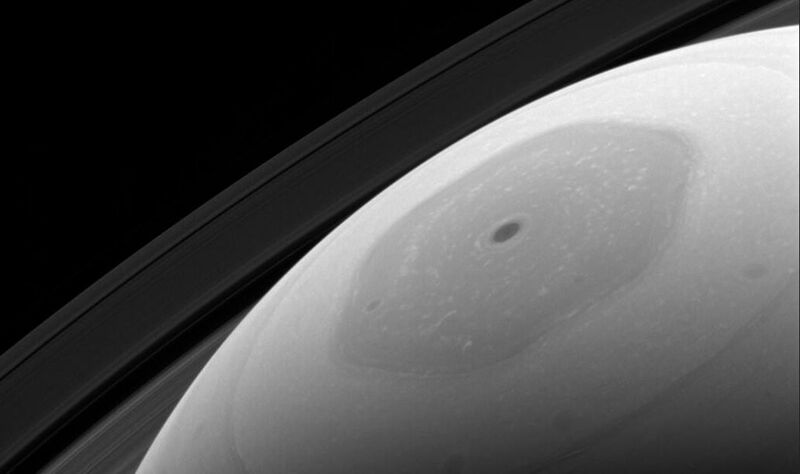 However, in addition to exploring a region of space no other mission has properly examined, Cassini’s final series of orbits around Saturn provide an unprecedented opportunity to study the massive hexagonal storm occupying the atmosphere of the planet’s northern polar region. First seen by the Voyager missions which flew by Saturn in 1980 and 1981 respectively, the storm is of a massive size – each side of the hexagon measures around 13,800km (8,600 mi), greater than the diameter of Earth. ; it rotates at what is thought to be the speed of the planet’s interior: once every 10 hours 39 minutes. However, due to Saturn’s distance from the Sun (an average of 9.5549 AU) and its axial tilt (26.73°), the northern polar region only gets about 1% as much sunlight as Earth does; making steady observations of the storm difficult. Cassini’s final series of orbits, passing as they do over Saturn’s north pole offers a unique opportunity to examine the storm in some detail. During the first passage between Saturn and its rings on April 26th, Cassini captured a string of black-and-white images of the region, include the vortex at the centre of the storm, which were subsequently stitched together into a short movie (above). The passes over Saturn during these final orbits should allow Cassini to use its wide-angle camera to gather detailed images of the storm whenever possible, which may in turn help scientists probe its secrets – including what is powering it, and why it has such a clearly defined boundary between itself and Saturn’s atmosphere at lower latitudes. 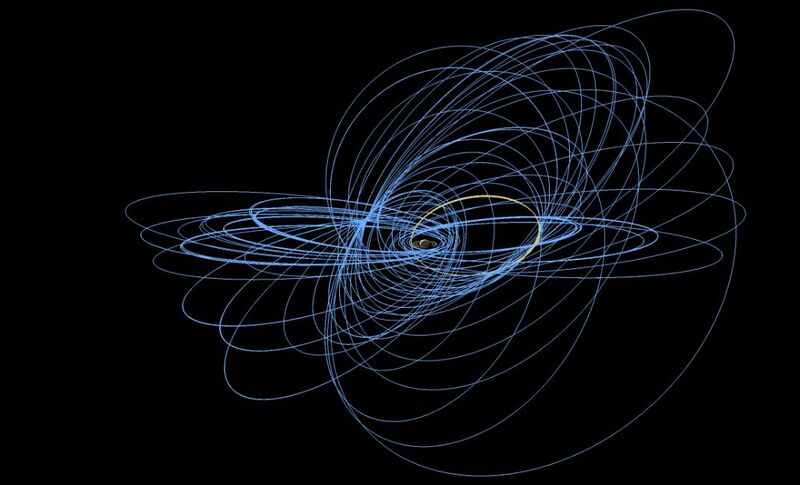 Cassini has already completed two “ring dives”, with the third scheduled pass occurring on Monday, May 15th. The mission as a whole will end on September 15th, when the vehicle will enter the upper reaches of Saturn’s atmosphere and burn-up. Two teams of four Chinese students are embarking on a year-long simulation designed to test a self-contained facility of the kind people might use to live on the Moon or elsewhere. 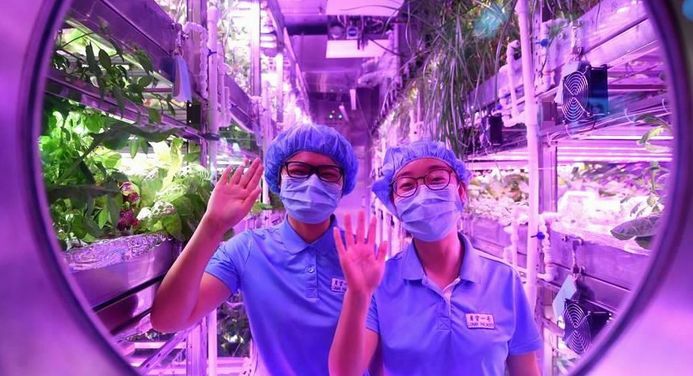 The unit, called Yuegong-1 (Lunar Palace 1) is perhaps the most advanced Bioregenerative Life Support System (BLSS) in the world,and is the first in the world to involve animals and micro-organisms as well as plants and humans. Providing a total of 160 square metres (1,720-square-feet) of space, the unit has two plant cultivation modules and a living cabin: 42 square metres containing four bed cubicles, a common room, a bathroom, a waste-treatment room and a room for raising animals. It includes the ability to recycle both water and urine, and a bio-fermentation process which takes human and food waste and recycles them to help fertilize and grow crops and vegetables. 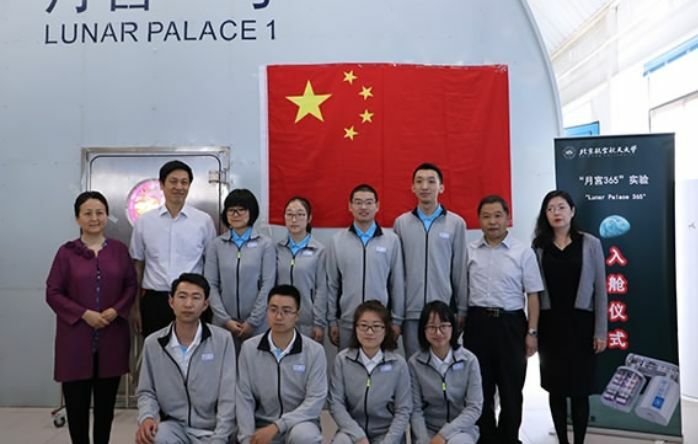 The unit has been built by the Beihang Astronautics Research University, and the two teams of students – comprising two men and two women in each – have been selected from among the university’s ranks. The first team of four entered the unit on Wednesday, May 10th and will remain in it for a planned 60-day study, after which they will be replaced by the second team. This team is expected to spend 200 days in the unit before they are swapped with the first team once more, who will spend a further 105 days in the facility. Friday, May 12th, 2017 marked the 200th space walk aboard the International Space Station (ISS). The activity, undertaken by current expedition commander Peggy Whitson, with fellow NASA astronaut Jack Fischer, had originally been scheduled for 6.5 hours. 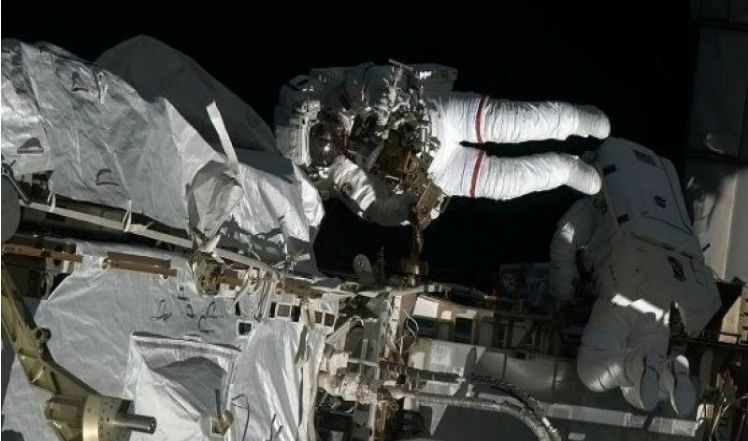 It was intended to see the two astronauts complete a number of tasks outside of the space station, the most important of which was to replace an ageing and problematic electronics box. However, even before the space walk got underway, mission planners had to re-think things after the crew on the space station discovered a water leaking from a hose in the space suit Fischer was due to wear. The hose is one of two that provide water, oxygen, power, cooling and communications for astronauts, and is the latest indication that the four EVA suits aboard the ISS are reaching the end of their serviceable lives. As I recently wrote, the current spacesuits used aboard the ISS, referred to as Extravehicular Mobility Units (EMUs), were developed for use with the apace shuttle. In all there are 11 of the suits, and during the shuttle era, these were routinely rotated between the shuttle / space station and Earth, where they could undergo regular maintenance. However, with the retirement of the shuttle, it has not been possible to return the four complete suits on the space station for this level of servicing. As as result, a number of water leaks have occurred with the suits aboard the station. In this particular case, the leak meant Fischer had to share Whitson’s spacesuit servicing system, which in turn meant both astronauts had to burn through their spacesuits’ battery power faster than usual. 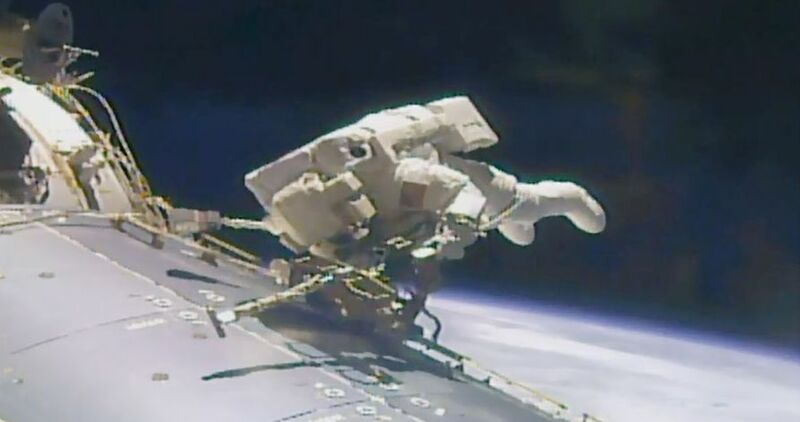 As a result, NASA opted to shorten the EVA to focus purely on replacing the electronics box that routes commands and data to experiments outside of the space station. Nevertheless, such was the efficiency with which Whitson – who recently took the record for spending the most cumulative time spent in orbit by an American astronaut – and Fischer completed their primary task, they had sufficient time to complete two other important activities: installing a cable to troubleshoot a problem with the cooling system on station’s $2 billion dark matter detector, and attaching debris shield onto an exposed docking port that is being prepared for commercial space taxis under development by SpaceX and Boeing. In all, crews on the space station have accumulated 1,247 hours and 55 minutes working outside the station during the 200 EVAs which have taken place since December 7th, 1998,when NASA astronauts Jerry Ross and Jim Newman completed attaching and outfitting of the first two components of the station, the Russian Zarya module and the U.S. Unity module, as a part of the STS-88 space shuttle mission aboard the Endeavour. And Now For Something Completely DifferentStar Trek: The Motion Picture (1979) perhaps isn’t the most popular of the Star Trek franchise film outings, and not everyone may have been pleased with Tron: Legacy (2010). But what happens when you take Daft Punk’s soundtrack for the latter and re-cut the former and then put the two together?That’s something amateur film-maker Patrick Collins pondered – so he decided to see for himself. The result is surprising: a 22-minute piece which sits somewhere between elongated music video and a very Trek short film (or mini-episode). True, the movie looses Jerry Goldsmith’s iconic soundtrack (most notably the magnificent Enterprise piece), but the modern-era soundtrack by Daft Punk fits things really well. The editing and music spotting is outstanding, and while 22 minutes might sound too short a time to pack everything the movie attempted to cover, it really does work. But don’t take my word for it – watch it for yourself. Preferably in full screen HD. My thanks to Jodi for pointing the film out to me ♥ .